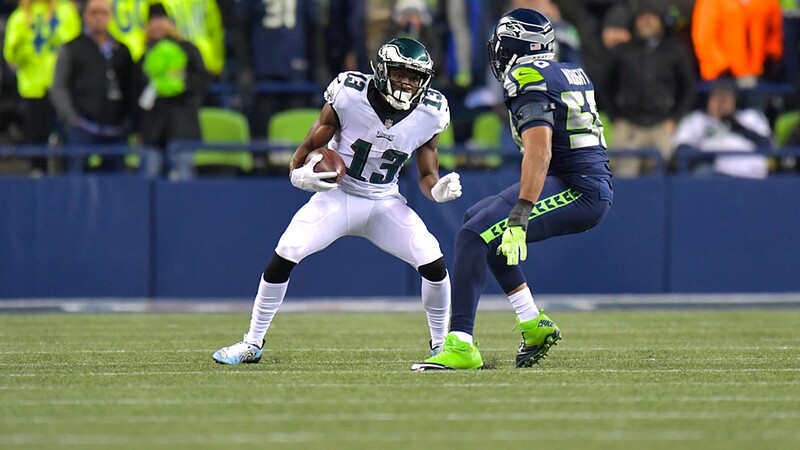 Nelson Agholor finished seven catches and a touchdown in Sunday’s loss to Seattle. Photo provided by the Philadelphia Eagles. The Seattle Seahawks knew in order to beat the high-flying Eagles they had to play error-free football and quarterback Russell Wilson had to be at his best. Seattle knew the Eagles had to commit their share of mistakes for them to have success. All that happened Sunday night in Seattle as the Seahawks knocked off the Birds, 24–10, who dropped to 10–2 on the season. The Eagles are tied with the Minnesota Vikings with the best record in the NFC, and are technically the №2 seed in the conference. The Eagles didn’t play like a title contender Sunday night. The Birds literally tossed away three touchdowns in this game and hurt numerous other chances with penalties and mental mistakes. On their second possession of the game, Carson Wentz missed a wide open Nelson Agholor, who had what appeared to be a clear path to the end zone. Another missed opportunity came when LeGarrette Blount barreled his way to the one-yard line in the first half only to have it pushed back to the 14 on a penalty by Alshon Jeffery. Defensive tackle Sheldon Richardson stripped the ball from Wentz on a quarterback sneak inside the 2-yard line on the Birds opening drive of the third quarter, the ball ricocheted up in the air and out of the end zone for a touchback. Late in the fourth-quarter, with the Eagles trailing by 14 points and Wentz trying to lead a rally, cornerback Byron Maxwell hauled in an interception in the end zone. There was plenty of blame to go around. The Eagles committed seven penalties for 64 yards, several were crucial, keeping Seattle drives alive. In the fourth quarter, Eagles head coach Doug Pederson elected not to challenge a lateral pass from Wilson to Mike Davis on third-and-8 which resulted in a 17-yard pickup for a Seattle first down that led to their third touchdown, sealing the win for the Seahawks. Wentz was 29-of-45 for 348 yards, one touchdown and one interception. He was sacked three times. The Eagles rushed for just 98 yards on 26 carries and no scores, almost 50 yards below their season per game average. The Eagles drove into Seahawks territory six times in the first three quarters but managed just three points before finally scoring their lone touchdown early in the fourth quarter to cut Seattle’s lead to 17–10. Most of the drives stalled because of mistakes and penalties. Agholor led all receivers with seven catches for 141 and a 27-yard touchdown pass in the fourth. The score was set up by a brilliant play by Wentz who escaped the rush deep in Eagles territory to hit Agholor with a 51-yard pass. But it was too little, too late. Wilson finished 20-of-31 for 227 yards and three touchdown passes and no interceptions. He was sacked twice. The Seahawks rushed 25 times for 101 yards and no TDs. But the reason the Eagles lost was the play of the Seahawks defense. They never let the Eagles off the mat. Seattle is 8–4 and one game behind the Los Angeles Rams (9–3), the team the Eagles face next on the schedule and on the road.